The proliferation of learning technologies and new laws supporting digital content in K-12 education have forced teacher education programs to redefine how candidates are prepared to teach with digital content. In preparing teacher education candidates, technological knowledge is just as important as content and pedagogical knowledge. How do teacher education programs ensure that candidates are adequately prepared to teach with learning technologies and digital content? The answer to this question lies not only in the empirical knowledge of how technology is infused in the teacher education curriculum and used during student teaching, but also in the self-efficacy and the self-assessment of candidates' technological skills. Using Bandura's (1977) self-efficacy theory as a guiding framework, this study seeks to address how prepared teacher candidates are to teach with learning technologies and digital content. Findings from the study show positive efficacy of candidates to digital content and learning technologies. In less than a decade over two million teachers must be recruited to replace retiring teachers, to meet increasing student enrollment demands, and to achieve smaller class sizes. If our information technology investments are to pay off in improved education, these future teachers must be technology proficient educators who know how to use modern learning tools to help students meet higher standards (http://www.ed.gov/pubs/promisinginitiatives/pt3.html). How are candidates prepared to use digital content and learning technologies? Are candidates confident in their abilities to use digital content and learning technologies to teach? How are specific content disciplines addressed through learning technologies? 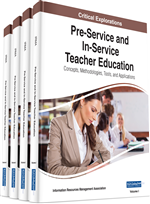 This chapter seeks to address these questions from the lenses of a cohort of 35 elementary and middle grades education candidates during their student teaching experience. This group was selected because they have completed all required course work relating to digital content and learning technologies and would provide an accurate measure of how well they were prepared to integrate technology in their practica. So, the outcome would give an accurate measure as to how well the teacher education program prepared them to teach with digital and learning technologies. Too often, the cultural and social teleporting of technology skills to education and teaching is made with such alacrity and used as a yardstick to measure technology skills. This misguided measurement diminishes the need to adequately prepare candidates to teach and learn with digital and learning technologies. Also, this assumption is dangerous and undermines the core structure as to how teacher education programs should prepare candidates for digital content and learning technologies. Knowledge and use of technology in a social context does not translate to teaching with technology. If this is true, this then should force teacher education programs to go beyond this assumption to address key issues such as, integration models, teaching styles, and the attitudes of candidates toward technology. The integration of digital content and learning technologies is not only a requirement to meet accreditation standards or licensure requirements in any teacher education program, but it empowers candidates to be functional global professionals. To fully understand global trends in digital content and learning technologies in education, it is imperative to understand the definition of educational technology. It is only through a succinct definition that teacher education programs can adequately prepare and train candidates. According to Lever-Duffy and McDonald (2015) the Association for Educational Communications and Technology (AECT), “Educational technology is the study and ethical practice of facilitating learning and improving performance by creating, using, and managing appropriate technological processes and resources” (p.2). Facilitate student learning and creativity. Design and develop digital age learning experiences and assessment. Promote model digital citizenship and responsibility. Engage in professional development and leadership.